Anyone who’s taken on a large-scale motorcycle restoration runs into an “Aw—f*ck” moment at some point. The best-laid plans can unravel, or get held up by a single seized bolt or incorrect parts order. And this week, that’s what’s happened with our featured CB550, owned by New York agency Woods Witt Dealy & Sons. The gremlin was a structural issue with one of the rims. After E3 powder coated and laced up the wheels, they dropped them off at Indian Larry’s to be trued. “The front wheel had a flat spot. After looking into our options, we called up Bucahanan’s and ordered two black aluminum Sun rims to finish the wheel set. As always, they did a top notch job and we’re back on course,” says Browning. 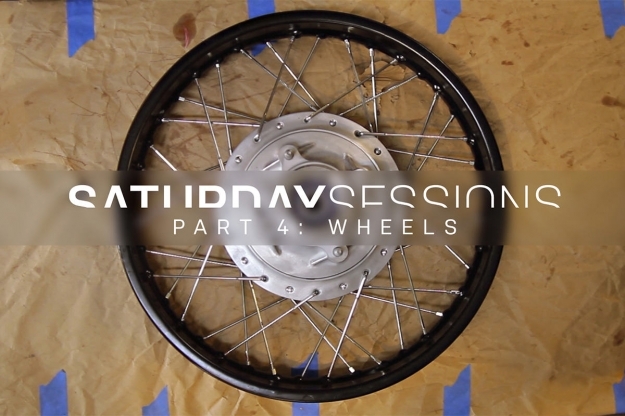 In this week’s clip you can watch E3 prepping and rebuilding the wheel set, mounting new Metzeler Lasertec tires, and getting the bike back to roller status.